This fella was on our plane, but was not part of our delegation. Plane seats have gotten smaller over the years, but I've never seen anyone fill up a seat like this. From left to right--me, Nick, Jeff, Alan and Greg with the mighty Mississippi in the background. Our meeting with Minneapolis Mayor JT Rybak who is a big twowheel advocate and raised $3 million to implement the city's bike share program. Here's a NiceRide bike share docking station. They have 65 stations with 700 bikes located all over Minneapolis. Annual memberships cost $50 and this entitles you to unlimited rides of up to 30 minutes. The system was rolled out in June last year and had 100,000 rides during the short season. They take the bikes in for the winter although lots of folks bike through the winter in Minneapolis--as many people as bike in the warm weather months in CBus. Go figure. Here are some shots of our merry band as we biked around Minneapolis. We had a filmmaker from the NYC company, StreetFilms, filming us--I'm sure this film will be a blockbuster! Here's a shot of the Minneapolis light rail. You can even take your bike on with you! They separate the bike trail from the pedestrian trail in Minneapolis--a great idea if you have the money and enough right-of-way to build two paths. They have a couple great bike stations along the bikeway that house shower/changing facilities, a wonderful cafe, a bike repair shop and storage for the NiceRides. Here's an innovative way to put a protected bike lane onto a busy street--it's called a "buffered" bike lane or a "cycle track"--the cars to the left of the bike lane are parked, not moving. Here's the signage they use. 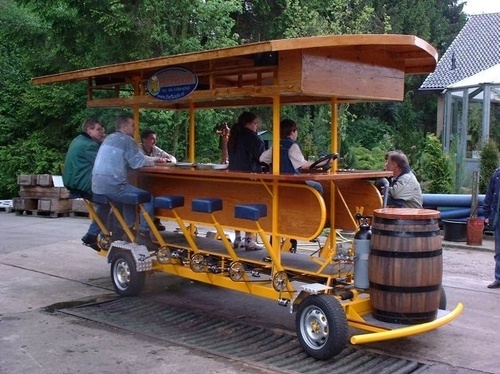 Nick Poppa, our city transportation engineer thinks these could work on 3rd and 4th streets--wouldn't that be great! I was wearing my usual OSU ball cap and when they saw it they went nuts and began to give me the one-finger welcome. I responded with a rousing round of "O-H".......................no reply. They modified their one-finger welcome when I raised my camera to snap this photo--all in good fun. The bottom line is Minneapolis is the leader in bikeway infrastructure and programing in the US. They have enlightened leadership and passionate grassroots support for the twowheeling revolution in their community. It has become very much a part of Minneapolis' "brand." And they have been able to achieve a 4% mode shift in the "coldest big city in the world." They have a saying in Minneapolis..........."What doesn't freeze you, makes you stronger." We were greatly inspired by our friends up north and hope to follow their lead here in CBus. Power to the Pedal!! Hello, I just randomly came across your blog today and thought i would say hello. I am a very recent transplant (about one week in) from Minneapolis to Columbus and also an avid cyclist. Enjoyed the pictures. I am looking forward to getting to know my way around on two wheels. I was wondering if you might have and good resources for finding trails or routes or cycling groups. Thanks. Have a good one. Doug-- where are you?? No updates since July? Hope that you are OK.